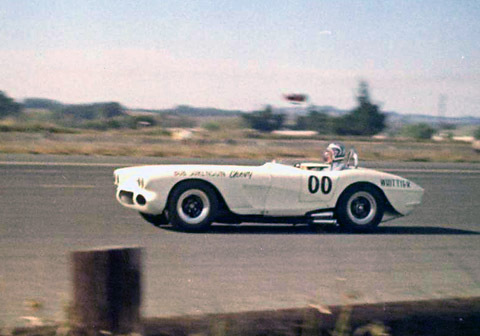 In 1962 "Corvette race" winner MacDonald became a "main event" winner in the famous "00" Corvette Special. The powerful car was known as the "Simpson" after its owner, Jim Simpson. The chassis was built by 'Old' Yeller' creator Max Balchowsky, and the Special's lightweight fiberglass body used Simpson's stock Corvette as a mold. From Ron Titensor: "Nat Reeder, 'The Glass Man' of 'Fiberglass Auto Body' at 5807 Sunset Blvd. built the body panels for the car. " 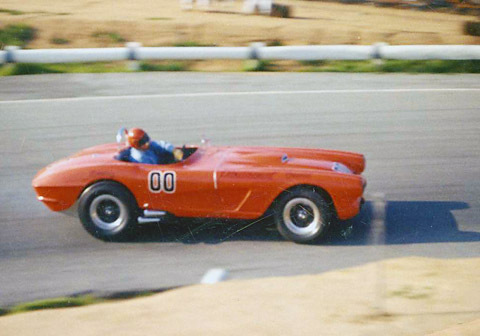 MacDonald later became very well-known for his many triumphs driving Cobras for Carroll Shelby. He won the 1963 Riverside GP for Shelby in a Cooper-Ford "King Cobra". He won here on March 4, 1962, after a tremendous race-long battle with Bob Harris in the Campbell Special. See some of this great race on this YouTube video. MacDonald winning at Cotati on November 12, 1961. 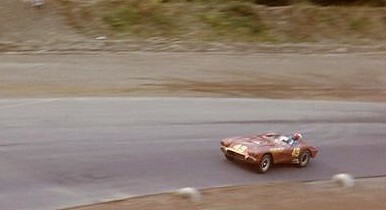 Don Hulette finished 2nd, and Dave Ridenour was 3rd. Don Hood offers an interesting anecdote about this race. 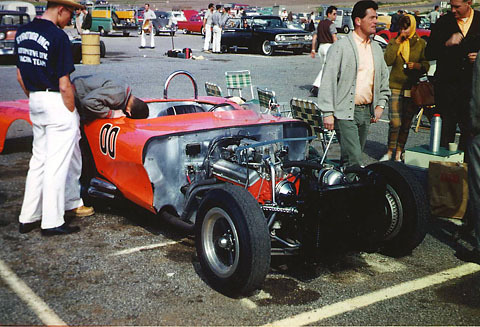 John McCann's photo of the Special in the pits at Riverside. No stock Corvette ever offered engine access like this. Santee sports car creator Fred Puhn (In blue t-shirt) and Paul Hudson, Santee welder (leaning into the car) look for go-fast ideas. Today, top teams in F1 and elsewhere keep the curious away and their cars well hidden. Pat Matthes of Honolulu bought the car in the early summer of 1962, repainted it, and ran it in Hawaiian races. He brought the car back to the mainland in September and MacDonald drove it at the SCCA Regional at Stead AFB near Reno and (shown here) the pro event at Pacific Raceways near Kent, Wash. He DNF'd in both events. More on MacDonald's life and career.